Agree 100%! Hoping it’s finally a Legioss worth getting. I got the Aoshima’s a few years back and was disappointed. Hoped Evolutions would be better but nope. Fingers crossed for sentinels try. Duh!! That’s the kit I asked YOU about a while back. Thanks for reminding me. Yeah I didn’t notice those tabs on the blades at first until I was looking more closely trying to figure out the mechanism that deployed them. I won’t know if it bothers me much until I get my VR-41. On the topic of the Sentinel VR’s, I have a vague memory of seeing something recently about 3D printed visor replacements. I seem to remember it was a see-thru blue that was smooth and didn’t have those tribal groves in it. Anyone else see that or was I dreaming? Yeah. Stick's VR-052F, Rei's VR-052T, Yellow's VR-041T, Houqet's VR-038L (red), and Shinobu’s..... which is a black VR-038L right? just has a camera instead of the big bazooka. Is a sentinel riobot VR-038L definitely happening? Wondering what the sentiment is from all y’all between the two. If you had to choose one to purchase over the other which would it be? I’m asking for a friend. I know the VF-31 isn’t that old of a design, but are any NEW VF/YF’s on the horizon that anyone knows about? There’s some websites out there with VF-36’s and things like that but I don’t think that’s cannon. Would anyone buy a broken VF-25A? Left arm is broken, and so is the gun. I don’t know if maybe someone would be willing to buy it at a discount for the parts maybe? i don't know. im new to this hobby. do people actually cast metal pieces for parts? im tenacious, i'll reach out to bandai and see if they'll sell me replacement parts too. thanks. 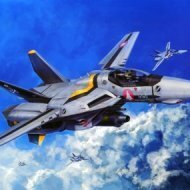 are you still selling the vf-25a? is there a way to purchase specific parts from anybody? I have a VF-25A and i broke one of the arms and my attempts to fix only made it worse. or does anyone take commissions to fix stuff for others?